Google announced the Pixel 3 and Pixel 3 XL today, and while they definitely seem to move the phone line forward, they don't seem to do that all that much. Google's focus seems to be largely on software an AI improvements, and while they'll surely help, the phones have to compete with other flagships, like the Galaxy S9. 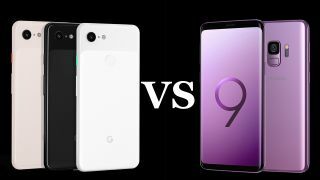 Unlike the comparison of Apples to Android we did for the Pixel 3 vs iPhone XS match-up, it's a little more straightforward comparing two Android flagships, and that makes this one a tight race. As we'll see, the Galaxy S9 is better in virtually every way, unless the Pixel 3 manages to have the best smartphone camera. The Samsung Galaxy S9 wallops the Pixel 3 in its design and display, not just for looking like a more strikingly premium phone, but also for catering to users' needs in more ways. The Galaxy S9 is a little heftier at 147.7 x 68.7 x 8.5mm and 163 grams, compared to the Pixel 3's 145.6 x 68.2 x 7.9mm and 148g. Both have Gorilla Glass 5 on the front and back, while an aluminum frame wraps around the phones' edges. But, where the Pixel 3 may have gone thinner, the Galaxy S9 makes better use of its size. The Pixel 3 still has readily apparent bezels, though they've thinned down from the Pixel 2, and the top and bottom bezels house stereo speakers. The Galaxy S9, meanwhile, just has thin strips at the top and bottom of the screen, which curves at each side of the phone. The Pixel 3 design easily lags behind Samsung's. The Pixel 3 offers an IPX8 rating against water ingress, but the Galaxy S9 holds an IP68 rating against both water and dust. So, it takes the lead in protection as well. For ports and slots, the Galaxy S9 just gets further ahead. It features a USB-C port for charging and Dex desktop support, while also including a 3.5mm headpone jack and a microSD card slot. The Pixel 3 just has a USB-C port. Both phones include fingerprint scanners, but Samsung goes further by also offering facial recognition and iris scanning. The displays just set the two phones even further apart. The Pixel 3 fits a 5.5-inch Full HD+ display for a pixel density of 443ppi. It has an 18:9 aspect ratio, HDR support, and uses an OLED panel. Everything is stepped up on the Galaxy S9. It's 5.8-inch Super AMOLED display has a 2,960 x 1,440 resolution for a sharper 570ppi. It also supports Mobile HDR Premium content. There's a fair bit of similarity between the two phones here. While the Pixel 3 runs Android 9 Pie and the Galaxy S9 runs Android 8 Oreo, the Pixel 3 doesn't gain much of an advantage from the difference. The Galaxy S9 will likely be getting the new operating system next year. That said, the Google's own phones will always get software updates sooner than 3rd party manufactured handsets. Both phones are powered by a Snapdragon 845 chipset (though some version of the Galaxy S9 have Samsung's own Exynos 9810) and come with 4GB of RAM. The base storage for each is also 64GB, with upgrades to 128GB available on both. However, the S9 internal storage can be configured as high as 256GB, and microSD card support allows for even more storage beyond that. The Galaxy S9 has a 3,000mAh battery, which is slightly larger than the Pixel 3's 2,915mAh battery. However, neither should struggle to get all-day performance. And, wireless charging is an option on both phones. The fairly even match-up here makes it tough to call, but Samsung's more flexible storage and ability to power a desktop-like experience though Dex may give it an edge for some customers. Both Samsung and Google know how to make a great smartphone camera. Samsung has done it this time with its dual-aperture rear camera, which has a 12MP sensor able to shoot using either a fast f/1.5 aperture or an f/2.4 aperture. The wide aperture combined with 1.4 micron pixels offers improved low-light performance. The rear camera also has optical image stabilization (OIS), and can record video in 4K at up to 60fps or in 1080p at 240fps. The Pixel 3 rear camera is worse on paper. It has a 12.2MP sensor with 1.4 micron pixels and an f/1.8 aperture. It does offer optical and electronic image stabilization, but its video capabilities are limited, only hitting 30fps for 4K and 120fps for 1080p. However, Google has shown its might in AI-powered image processing, so it may still pull ahead in image quality. But, we'll have to wait and see. The Pixel 3 does offer a big more with the front-facing cameras, since it has two 8MP sensors. One has a 97-degree FOV for group selfies, and the other has a narrower FOV but faster f/1.8 aperture for better low-light performance. The Galaxy S9 front-facing camera has an 8MP sensor with an 80-degree FOV an wide f/1.7 aperture. It may not be as flexible, but it does enable AR Emoji for whatever that's worth. For all the premiums that the Galaxy S9 seems to have over the Pixel 3, perhaps the most surprising thing is that it's also cheaper (generally). The Galaxy S9 (64GB) launched at $719 (£739 / AU$1,199), and it isn't hard to find on sale for even less than that. Adding another 64GB of storage doesn't even bring the cost as high as the Pixel 3's price. The Pixel 3 is starting at $799 (£739, AU$1,199), but a storage increase bumps that up even further. Given the newness of the Pixel 3, it seems unlikely we'll see major price drops soon. Meanwhile the Galaxy S9 gets deals all the time, and we'd expect even better ones when Black Friday and Cyber Monday come along. Google really needs to offer something special with the Pixel 3 camera. The fact that it's lagging behind in so many areas to a cheaper phone that as released more than half a year earlier is not good. While some people may take comfort in the Android experience Google offers and the guaranteed OS updates, Samsung is no slouch when it comes to offering a good experience. The Galaxy S9 offers great performance, a dazzling screen, and a good camera all packed into an outstanding design. The Pixel 3 has a design that's not quite keeping up with the times as well as the larger Pixel 3 XL, and its screen isn't topping any specs charts, yet Google wants a premium price. Unless the camera tops every other phone currently on the market, it'll be a tough sell.